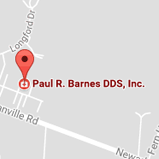 Welcome to Paul R. Barnes DDS Inc. - Dentist Granville OH | Paul R. Barnes DDS Inc. Welcome to Paul R. Barnes DDS Inc.
At our office your dental needs will be treated as if you were a member of our own family. Dr. Paul R. Barnes and his qualified staff have created an office that is truly warm and friendly. Dr. Barnes brings a deep experience to your oral care. He has been practicing since 1979. We value you the person, and welcome you to our office where the only doors you will need to open are the first ones into the office. Contact our Granville, OH office today to schedule your complimentary consultation. Serving Granville, Newark, and Heath, OH (Ohio) - Paul R. Barnes is your doctor of dental surgery offering Invisalign®, Zoom!®, and Botox, pediatric, general, and cosmetic dentistry for children, teens, and adults.